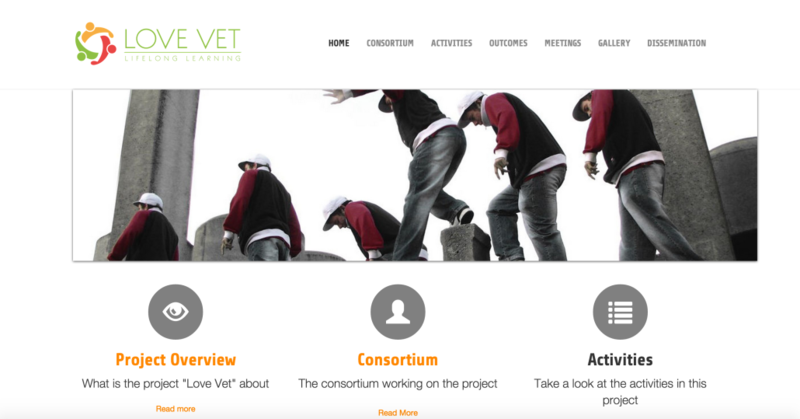 Effective Webdesign maakt deel uit van een Erasmus+ project “Love Vet”. Het betreft een drie jaar durende project waarin wordt samengewerkt met een zes-tal partners uit verschillende Europese landen. Een overview van het project wordt onderstaand beschreven. Effective Webdesign is verantwoordelijk voor de website “http://www.lovevet.eu” en een collaboration tool OnlyOffice waarin alle projectleden met elkaar kunnen samenwerken. Daarnaast verzorgt Effective Webdesign de installatie van Moodle en Mahara tooling ten behoeve van test doeleinden voor de eindresultaten van het project. De website is gemaakt in Typo3 CMS. Due to the globalization, the exponential growth of knowledge and a fast technical development the challenges for skilled workers constantly increase on all levels and in all fields of work. In VET, despite the buildup of expert professional knowledge, the development social competences as well as competences in decision making and responsibility are tasks of the future. It is expected that skilled workers possess a high command concerning reflexive competences in their job routine to be able to master there work processes efficiently and independently. Many EU countries face a high number of breakups during VET or during the transition from VET onto a respective professional occupation. Often employers complain about a lack of competences among young professionals. It is also obvious that all players in the process of VET have to improve their own competences. There is an urgent need for a much tighter cooperation between all the players in VET. The target of an altered structure in VET is to take trainees from “dependency to independency”. Learning is understood as a self-controlled and self-organized process that changes the understanding of role in the processes of learning and teaching in a way that the learner takes on responsibility for his own success in learning. Teachers and trainers act as tutors or coaches. To achieve a change of perspective in the learning process of trainees it first takes the development and testing of a training program for teachers/trainers in a sense of an altered teaching and learning culture (cooperative and self-directed learning). Vocational schools and companies act cooperatively aiming at a “change of perspective” in the learning process of trainees. IZ Cool as a friends’ association of the Impulszentrum für co-operatives offenes Lernen, Austria, (long time experience in the field of cooperative learning and the introduction of respective learning concepts at schools). The project participants predict that the realization of the project in their networks change the attitudes and roles of all players in a considerable way. Thus companies and schools cooperate much closer and estimation and quality of the education increase. For trainees the transition to the job market will be much easier; the results of VET meet the needs of the economic sector more precisely. The close cooperation between vocational schools and companies is strengthened on a regional and national level by chambers, employers’ associations and unions and embedded in national education systems with the help of political responsible bodies. On the EU level the concept will be adapted and embedded in the respective national frameworks by several organizations using the existing European Transfer Concept (LOVE trans). In the long term the project can be successful in the reduction of youth unemployment and the number of those that break up their vocational education; the project becomes an element to secure the economic and social future of the EU. Because of the complexity of the processes within the project a duration of at least three years is sensible.